Chili's is easily my favorite chain restaurant of it's type. I'd pick it over Applebee's or Ruby Tuesday's or 54th Street any day. I can never decide what to order there and inevitably end up choosing the Triple Dipper every time. An easy solution for the indecisive. Chili's in Juárez is as equally delicious as the American counterpart and even boasts some impressive additions to it's menu, my favorite being the Jalapeño Margarita. Unfortunately, it's prices are also equal to that of the US and with our current income, eating out is rarely an option. 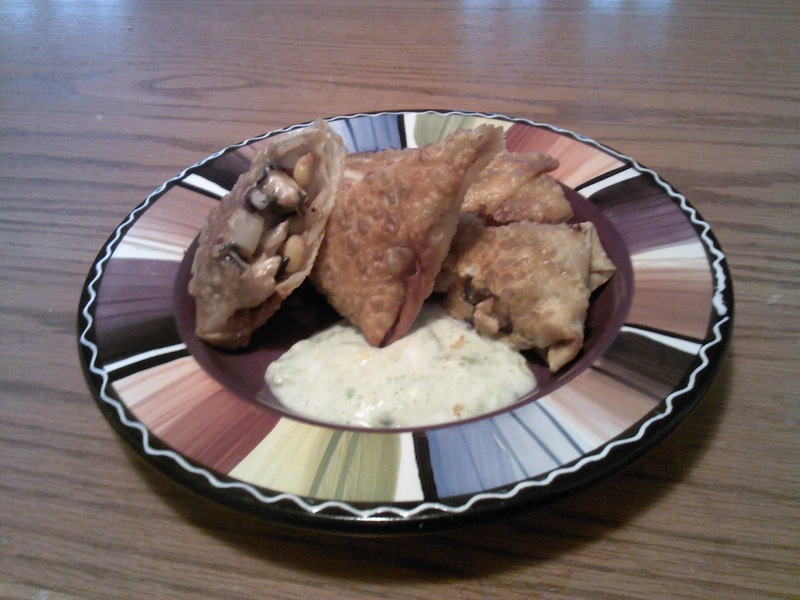 And so, I took it upon myself to recreate my favorite item from the Chili's menu: Southwestern Eggrolls. 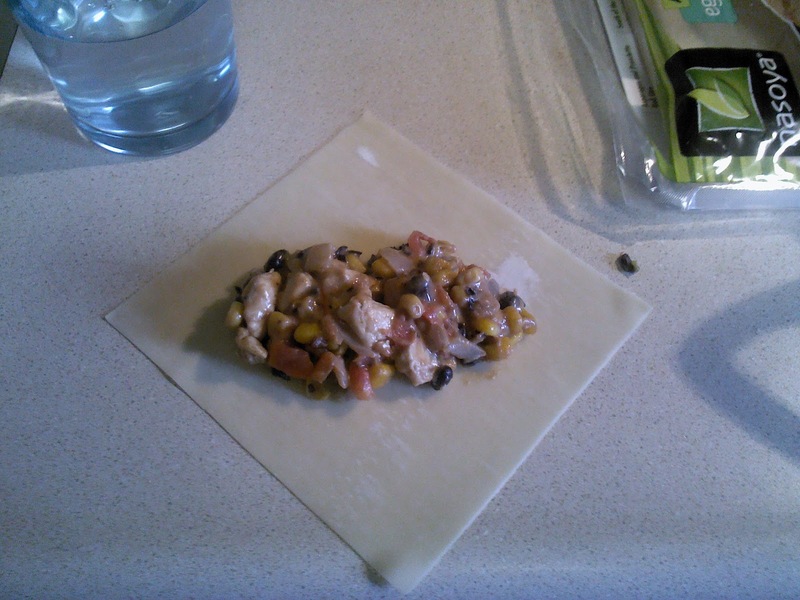 The menu description is "a crispy flour tortilla filled with smoked chicken, black beans, corn, jalapeño Jack cheese, red peppers and spinach. Served with avocado-ranch dressing." I can work with that. I googled some recipes but each one seemed to have all sorts of additional spices added and I really think the ingredients speak for themselves. I decided to get rid of the sweet red peppers as well and replaced them with fresh diced jalapeños to add a little kick. I also prefer the thin, crispy texture of an egg roll wrapper than that of an actual fried tortilla. 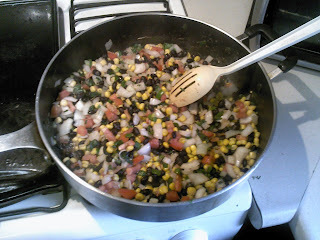 The following is my own recipe, sans unnecessary spices and salt. As much as I hate it, I really am trying to cut back on sodium. The cheese in this recipe provides more than enough though so you won't really miss it. Egg rolls wrappers (or flour tortillas if egg roll/wonton wrappers are not available), 1 whole chicken breast without skin, de-boned, 2 Roma tomatoes, 1 medium white onion, 1 jalapeño, 1 can yellow sweet corn, 2 cups fresh spinach, 1 cup shredded cheese of your choice (I chose mild cheddar), 2 cups cooked black beans, ranch dressing, avocado, fresh cracked black pepper. 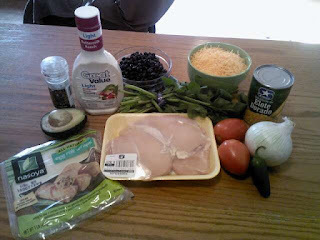 To make dressing add 1 half diced avocados to 1 half cup of ranch dressing. Add fresh cracked black pepper to taste. Cover and refrigerate while the eggrolls are being prepared. Dice chicken and heat with 1 tbsp. oil (not pictured because I'm thorough like that) until cooked through and set aside. Dice veggies and cook until onion is translucent. Remove skillet from heat and add in your cheese. Stir until it's incorporated. 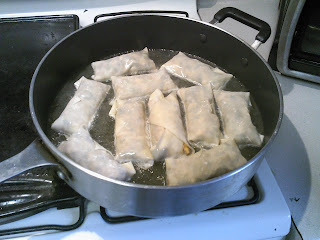 Fill each eggroll wrapper with 2 heaping tablespoons of the filling mixture. 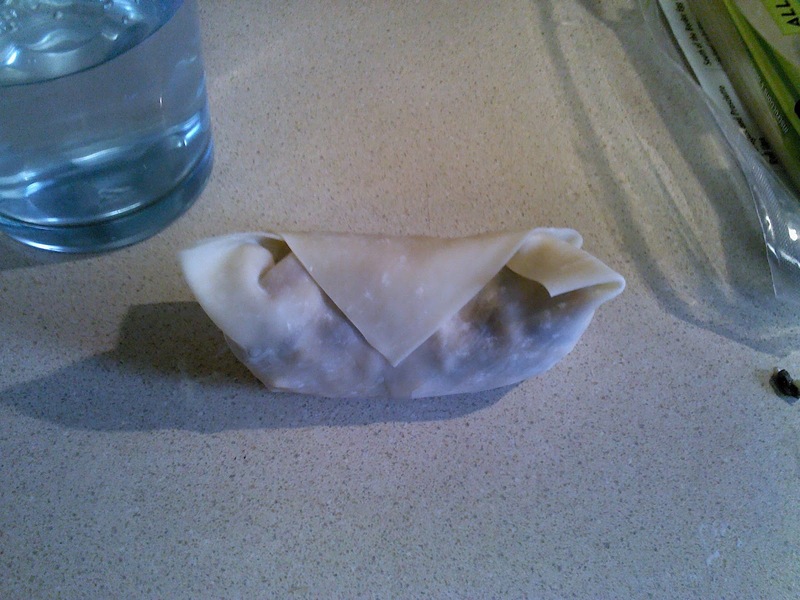 Fold in the sides of the eggroll wrapper as you would fold a burrito, unless, of course, you are from Northern Chihuahua where they don't fold the sides in and the burrito filling just falls into your lap. Then you are just fucked my friend. Fold your eggroll to completely envelope the filling mixture. 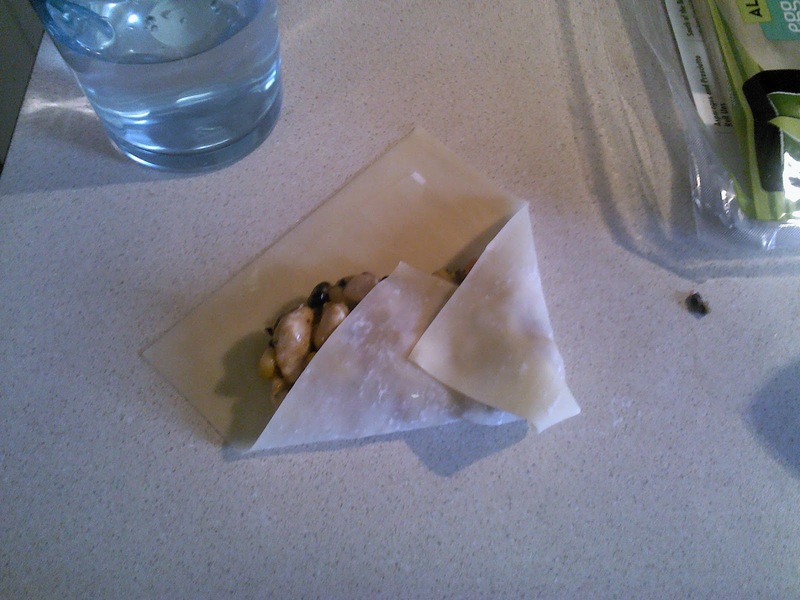 Set aside and continue this process until you have used up all of your filling and/or wrappers/tortillas. 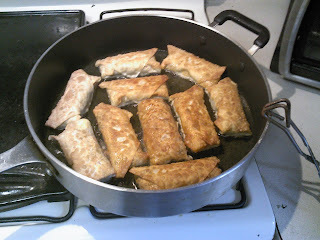 In a large skillet of oil (about 1" high), cook eggrolls over medium high heat. Cook until golden brown, about 3-5 minutes, then flip to cook the other side. Remove eggrolls from oil when completely cooked and drain on a paper towel lined plate. This recipe makes about 20 eggrolls. Serve with avocado ranch dressing. Bon appétit and bocagasmos por todos! *Leftovers can be frozen and are delicious when reheated for 10-15 minutes in an oven preheated to 400 degrees. Oh they're delish! I've made them a bunch of times before. Super simple and nice to have on hand in the freezer for snacks and lunches. Thanks Emily, I'm a new reader and I'm trolling back posts. This weekend I'm gonna have me a mexican cookfest. Doing the refried beans from an earlier post and now these. Enjoy your weekend! I've enjoyed reading!